After continuing our journey with John Crichton last week with “Lava’s a Many Splendored Thing” and “Promises,” our Farscape re-watch continues this week with the sixth and seventh episodes of Season 4. “Natural Election” actually happens to be one of the few episodes of Farscape that I consider genuinely subpar. Farscape is the rare show for which I could watch absolutely any episode and find aspects to enjoy, and that fact remains true for this one. Overall, however, I find the plot to be mostly unremarkable, the pacing surprisingly sluggish, and the characters’ emotionally-driven conversations to feel too tertiary to the main story, when either it should have been the other way around, or the two should have thematically complemented one another more organically. It starts off with a pretty compelling premise. John has gotten so good at wormholes that he can actually sense when one is about to form, but immediately after proving that ability, Moya is suddenly enveloped by a something that completely blocks all of the stars. All they see is pitch blackness. Shortly thereafter, they realize that it’s a type of space-dwelling plant life that has attached itself to Moya and begun eating her, at which point the episode starts to get less interesting. It certainly has some clever, inherently Farscape aspects, particularly the reveal that the plant at first seems allergic to Scorpius, which ultimately turns out to be that one of the ingredients in his coolant rods are poisonous to it. Unfortunately, this sort of Moya-under-attack story has been done before, and in far more lively ways, at that. “Natural Election” features strangely slow pacing and an odd lack of much of the zippy inventiveness that usually marks Farscape bottle episodes. It certainly has some good character moments. For example, I love that Aeryn actually confides in Chiana regarding the pregnancy and the possibility that John isn’t the father, since there are only very rare moments where we get to see her connecting with any female crew members aboard Moya. And I even love that she then goes on to tell D’Argo, because that’s also very Chi. However, what could have been an ever-escalating snowball of whispered secrets and rumors utterly fails to build momentum or any real sense of drive, leaving most of the comedic potential squandered and the thread feeling oddly lifeless. Furthermore, although the episode is partially titled around the concept of them electing D’Argo as their captain, that election feels completely disassociated from the bulk of the episode. Had the story been tailored around demonstrating why he is the right choice, it would have been far stronger. Early on, they make a point of saying that they have chosen to swap the role of captain between the various crewmembers before making their decision. This concept has a lot of potential for a fun episode in which each of them show their strengths and/or weaknesses in the role, while trying to cope with disaster, but it isn’t taken advantage of. Rygel is captain throughout the episode and does very little but feel guilt over Moya being badly hurt on his watch. The final scene between John and Aeryn is fascinating, however, for a number of reasons. Perhaps first and foremost is her revelation to him that she has stopped distinguishing between the two Crichtons. Now, to her, they are truly one and the same, meaning if this baby is John Crichton’s, it’s this John Crichton’s. After admitting in “Dog with Two Bones” that she loves John Crichton, not one or the other, here she finally makes the final step of saying she considers/realizes him to be the same man who she was with on Talyn. Secondly, she reveals the quirk of Peacekeeper physiology that makes it possible for John to not be the baby’s father: namely that, since they couldn’t afford to have soldiers giving birth during long military campaigns, PKs are genetically bred to hold a fertilized egg in stasis for up to 7 years. They need to be “unlocked” by a physican, meaning Aeryn could potentially have conceived this child years before ever meeting John. This later turns out not to be the case, but it is a real possibility for now. What I also love about the scene is how strong John remains throughout it. Although he loves Aeryn desperately, he also has the self-respect to resist her lack of forthcomingness and total honesty with him. As he tells her, he would unquestioningly trust her with his life but not with his heart–a gorgeous phrased sentiment, though very sad. And so he effectively pushes her away until she gets her story straight, an act of remarkable strength, as well as yet another Farscape feminist flip, with Aeryn in the stereotypical male role of being emotionally distant and reserved, and John in the stereotypically female role of giving a relationship ultimatum until his partner decides to open up to him. I also wonder whether John’s behavior is also related to the real reason he will start taking Noranti’s drugs to “forget”/dull his feelings for Aeryn, namely an attempt to keep Scorpius from being able to use her against him. In basically all external details, and certainly stylistically, the second episode written by Ben Browder couldn’t possibly be more different than his first. 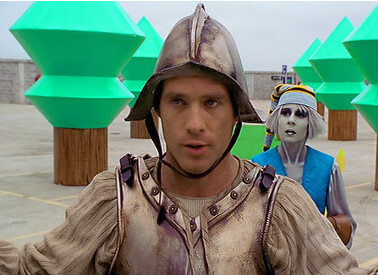 Whereas “Green-Eyed Monster” was a relatively restrained bottle episode that had a nifty underlying sci-fi concept but underneath it all was really a beautifully realized domestic drama aboard a spaceship, “John Quixote” is an experimental explosion of unfettered imagination and lunatic genius and feels like the closest the show would ever come to depicting what Farscape as directed by Terry Gilliam might have looked like. At the same time, there is underlying method and structure to the madness. While to a casual observer, it might just seem like mindfrell for the sake of mindfrell, underneath the at-times demented, seemingly chaotic atmosphere, the episode, at its heart, is another taking-stock-of-the-current-state-of-Crichton piece of the sort that the show would do at least once per season, and like “Green-Eyed Monster,” one that takes a very perceptive view of the John-Aeryn relationship, examining it from a new angle while propelling that arc forwards. At the same time, it is also a remarkably dense and important episode that can be seen as foreshadowing the season’s upcoming major arc in microcosm, often in extremely subtle ways, and therefore is one that requires revisiting in order to pick up on all of its nuances. As one might expect from the title’s pun on “Don Quixote,” this episode does indeed put John in the role of a roving knight from ye olden times, complete with medievalish armor, and with Chiana as his sidekick/Sancho Panza, in the classic garb of a royal fool. This isn’t a dream, however, but a virtual reality video game that Chiana convinces him to play and which turns out to have actually been based on John’s life, of all things. As we later learn, the game designer had based it on the memories that Stark had absorbed from Talyn-John when he died. And while we never learn the full details of how this came to be, either in this episode or when they finally reunite with Stark at the end of the season, the fact that the next time we meet up with him, he is a captive of the Scarrans, we can assume that the game was created while he was under durress, perhaps by a tech who works for the Scarrans. Although within this episode, Crichton professes anger at Stark for the game’s existence, Stark would have had no reason to betray him in this manner, so odds are that it occurred without his permission or possibly as the result of torture. The real Stark isn’t as vindictive as the doppelganger version in this episode, with his mask on the opposite side of his face. And one thing that is for certain is that this is yet another example of the fact that Crichton and Co. have become either celebrities or at least notorious throughout the Uncharted Territories, with some likely thinking of them as folk heroes and others villifying them. No matter which side any given person falls on, however, there is clearly interest in roleplaying him in the form of a videogame–a videogame that John himself is now playing and which additionally was based not on his own perceptions but a mix of Talyn-John’s and Stark’s. Which is why the game is only based on knowledge either of them would have had. For example, Noranti and Sikozou do not appear because they don’t know them, D’Argo is dressed in a pre-Season 4 costume, Aeryn’s hair done in an earlier style, as well, and the bizarro version of Jool that appears has regressed to the whiny brat that Talyn-John and Stark knew, with none of her later character development intact. The episode’s main aesthetic is Nintendo platformer quest game a la Super Mario Bros. meets fairy tale, genres that dovetail together very smoothly, given the rescue-the-princess angle of the former, which allows the episode to take advantage of a lot of similar genre overlaps. For example, Rygel briefly appears as the Black Knight from Monty Python and the Holy Grail (another Gilliam link), before John bests him–this significantly occurs in the same parking structure in which he threw the businessman version of Rygel to his death in Won’t Get Fooled Again, versus here where he runs him over with a van, which works on two levels, both because it references the previous “out-there dream” episode and because Stark would have seen this structure buried in John’s subconscious memory of that episode–Aeryn as a blonde princess in a tower, Crais as her ogre husband (whose design was significantly based on the ogre from Gilliam’s Time Bandits), Harvey as her Pinocchio-esque manservant, and D’Argo, Chiana, and Jool in a twisted little spin on Hansel and Gretel. Farscape gives the latter a clever gender subversion, as well as a dose of kink, by having D’Argo as an overgrown Hansel in lederhosen, wielding an enormous lollipop as a weapon, while Chiana and Jool are both witches who are trapped in a cage by the boy, begging him to eat them, Jool later whinging her head off when he chooses Chiana for his meal, which reflects Stark’s view of Chiana–not knowing her very well, he likely only sees her rambunctiousness and hyped up sexuality–and Jool, he–again–only remembers as the brat she was at first. Interestingly, the idea of the two of them captured by a villain who wants to devour them–in a manner of speaking–is also rather reminiscent of the events of “Scratch n’ Sniff,” which makes me wonder if it’s a subtle indication of the potential psychic link between the two Crichtons that later grants Moya-John some of Talyn-John’s memories. It also reflects Jool’s feelings for D’Argo, despite his former relationship with Chi. Besides the fairy tale levels of the game, however, there is also the more seemingly legitimate Moya level, which manages to trick John into thinking that he’s actually logged off for quite a while, even though both he and likely we don’t necessarily notice all the signs–a few of which I mentioned earlier–on a first viewing. And the reason it fools him is in how effectively it plays into his worst nightmares about Scorpius’ presence aboard Moya and his plans for Aeryn, and by reasserting them, they seem to confirm for John that he was right to be so concerned all along. When he “returns” to Moya, everyone is freaking out because Scorpy has taken over the ship, and no one can get through to Pilot. In his commentary, Ben Browder explains that what this sequence actually is is a deliberate composite of numerous episodes and motifs from across the series. And so we get a lot of swoopy shots of everyone running through Moya’s corridors, a la so many stories. And then John and Aeryn rappell into Pilot’s den to find that he has turned on them, the DRDs surrounding him beginning to shoot at them, all of which occurred in “The Way We Weren’t”. Meanwhile, the collar they discover surrounding Pilot’s neck, as well as the revelation that Aeryn is working for Scorpius are reminiscent of “A Clockwork Nebari,” while Aeryn overpowering and knocking John out is the sort of thing that’s been happening since the day they met. This is what John had been afraid of ever since Aeryn returned in “Promises”–that there was a sinister underpinning to Aeryn having arrived with Scorpy and having made John promise not to kill him. It’s not clear whether she is being somehow controlled or has been brainwashed, but she is effectively the embodiment of his nightmare flash in “Promises” of Aeryn in Scorpy gimp suit and makeup. This is followed by Scorpy locking John up aboard Moya, his home now once returned to the prison ship it once was, and threatening to harm Aeryn and his other friends if he doesn’t surrender the wormhole data. John responds by cutting his finger and writing out the complex wormhole equations on the floor in his own blood, an extremely surreal image that many viewers took as another hint that Crichton had to still be in the game, because surely he couldn’t have spilled that much blood and remained conscious/alive, although according to Browder, they actually measured out a pint of fake blood and were able to write all of that out with it, and so that isn’t necessarily a hint after all. Either way, John stands on a crucial part of the equation, hiding it with his foot, in order to lure Scorpy in, and then “traps” him in the “game” by sticking his hand on the controller. The game cleverly takes John and Scorpy to the first level, in order to make Crichton think he’s succeeded, and then Aeryn “pulls him out” to the Moya level again, where it seems Scorpius has been defeated, still hooked into the game. This is also, however, when the always perceptive, observant John starts to get suspicious, particularly when Aeryn tells him, “Listen, John, I came back for you. Nothing else matters. I just want to be with you.” The funny/sad thing is that, when his worst nightmare was playing out before him, he at first thought it to be true, because it is so similar to how his life tends to go, with everything blowing up in his face, along with the loss of everything he holds dear, and yet it’s only when he starts to see his deepest wishes realized that he knows something is wrong, that this can’t be Aeryn, particularly given this was only an episode after he again perceived her as pushing him away in regards to the pregnancy she curiously doesn’t bring up here. And that’s when he looks down, notices one of the in-game balls that “Stark” had given him and realizes he’s still physically on the transport pod with Chiana, playing the same game he has been all day. And speaking of which, the Moya level isn’t the only way in which the game has been messing with him. In fact, nothing is as it seems, for he can’t even trust his “faithful” sidekick. The Chiana who has been by his side since the Hansel and Gretel level isn’t the real Chiana, after all. She is actually the Chi NPC who had been previously locked up in the cage with Jool, having swapped places with the real Chiana, who has this whole time been tied and gagged in the gingerbread house, which John finally realizes his second time through. This has been an episode full of fake characters: fake Chi, fake Aeryn (both the one on Moya and the princess version), fake Jool, fake Crais (whose ogre persona reflects Stark’s dislike of him, he being unaware of his later sacrifice), fake D’Argo, fake Rygel, fake Stark, fake Zhaan–when John and Chi think they’re about to reunite with their long-lost friend, it is instead a male Delvian imposter (a reflection of the fact that Zhaan was originally going to be a man when the show was first being planned out) who runs a cheap fortuneteller business out of his van, and who happens to be played by long-time Farscape director, Rowan Woods–and this sets up the next twist, which is that Aeryn isn’t actually the princess he should have been going after, after all. Once he returns to the tower and defeats the ogre, planting a fairy tale kiss on Princess Aeryn’s lips, nothing happens. Incidentally, this princess character is a comedic tour de force for Claudia Black, who rarely got the opportunity to be this out-and-out silly on this show, outside of “Crackers Don’t Matter” and “Out of Their Minds,” but this is on a whole other level from those two, playing a seemingly innocent but actually rather devious person with an absolutely epic accent that, according to Black, is one part speech-impedimented-Bishop-from-Princess–Bride, one part Southern belle, and one part Mike Tyson. “Well, I’m not the Princess you seek, but we could still have a really good time” in that accent is hands-down one of my favorite moments in all of Farscape. ZHAAN: Be silent, Stark. Is that really you, John Crichton? JOHN: I think…yeah. And you’re…? ZHAAN: Zhaan. For all that matters. This Stark wishes to keep you here. He blames you. ZHAAN: He believes I died for the love of you. JOHN: A lot of people have died because of me. ZHAAN: What is it you wish of me, John Crichton? A kiss? Have you wasted my death and the deaths of so many others? ZHAAN: Then I suggest you find out, before anyone else dies of the love you. And this is really the crux of the episode. Although this isn’t actually Zhaan’s spirit, in this moment, for all intents and purposes, she becomes the real Zhaan, querying John as to how he has been living his life in her absence. She asks a tough question of him, and his answer is honest. At this murky point, he’s not sure whether he has been doing the right thing. Sure, he kept the PKs from getting the wormhole knowledge, but was that the right decision? Could that actually have been the only thing to keep the Scarrans at bay, as Scorpius had warned? Later on, he will cause more deaths and yet eventually afterwards truly come to not waste them. His decisions will have a sizable impact on the galaxy and ultimately come to save it. For now, however, he is faced with the overwhelming responsibility of all of the havoc he has caused, coupled with his obsession for Aeryn, which he has been realizing more and more lately could be causing harm. Significantly, it was immediately after Zhaan became ill as a result of bringing Aeryn back to life–which Zhaan felt the need to due because Harvey/John had killed Aeryn, thus explaining why “this Stark” believes Zhaan’s death to be John’s fault (and I would say that the real Stark, in his heart of hearts, doesn’t actually believe this but that that doesn’t mean that some part of himself might not at times have this thought on his darkest days, which the game then transformed into this vengeance-driven through-a-glass-darkly version of Stark)–that Aeryn put the initial kibosh on giving into her feelings for John. She didn’t want anyone else to die as a result of their love. And now the tables have turned. Aeryn might finally be ready for John, but a visit from “Zhaan” causes him to consider the same thing she did at the start of Season 4: that it might be safer for his friends and him to shut off his feelings for her. And, again, remember, the fairy tale plot in which his obsession for Aeryn nearly blinded him as to who the real princess was (as well as arguably kept him from noticing that Chiana had been replaced) is also wedded to the nightmare scenario in which Scorpius realizing that Aeryn could be used against him nearly led to disaster. And that is why, in the final scene, he chooses to take Noranti’s drug that will help him forget Aeryn–not in a literal sense, because she’s aboard the ship and unavoidable, but in the sense that it will block his feelings for her and allow him to distance himself, without his emotions getting in the way. And while in the moment, this seems troubling and unhealthy, John later does explain his reasoning, which is that if he can block away his feelings, then he can cause Scorpy to think that he no longer cares for her, which will in turn keep him from being able to use her against him, as he did in the game. And while some fans have argued that this isn’t fully logical, because how could Scorpius ever be fooled by that, I would argue that it isn’t meant to be completely logical. While John has a justification for his actions, I also think that on some level, he’s also in a lot of pain over Aeryn and simply wants to shut off that pain for the time being, particularly until he can answer for himself whether all of those deaths have been in vain or not. Earlier, I also referenced there being a number of elements in the episode that foreshadow later events, and here are a number of them: the fake Chiana foreshadows the bioloid Aeryn in “Bringing Home the Beacon”. John’s quest for the princess foreshadows his rescue mission of Aeryn in the last portion of the season (the “We’re So Screwed” trilogy). In fact, John’s kissing the “wrong” princess could be interpreted as another bioloid reference. The virtual reality itself foreshadows the concept of unrealized reality, particularly the one that John and Scorpy travel back into to get information on Katratzi (“A Constellation of Doubt,” “Prayer”). Just as in “Prayer,” John “pulls” Scorpy into an alternate reality. Even Zhaan being the real princess for John to kiss in the game refers to later events in the season, as the alternate reality in which Stark-in-the-form-of-Sikozou says the word, “Katratzi,” which ultimately leads them to Aeryn, is also the one in which Stark is in love with Aeryn and John with Zhaan. John, therefore, had to travel to the reality where Zhaan really was his “princess” in order to discover Aeryn’s whereabouts! Furthermore, John offers to trade his wormhole information for Aeryn here just as he will offer to do so at the end of “Constellation”. –In the commentary, Browder talks about how he really wanted to create a showcase for the other actors in this piece, to give them an opportunity to show off what they’re capable of. I already spoke of Black’s chance to flaunt her comedic prowess, but further, Paul Goddard gets to demonstrate his classical training via the Shakespearean-style sonnets he delivers seemingly effortlessly, along with the more sinister edge underlying his jesterish character, and Gigi Edgley gets to flaunt her stage combat skills, as well as get a more prominent role in an episode, nearly from start to finish, than she usually gets, which was apparently a request of hers. –Along with the Monty Python references, Browder also threw in some Douglas Adams, via the “talking-head” vid-screen John, which is himself a reference to the cult British sci-fi series, Max Headroom. The Adams bit is the elevator dialogue about being tired of going up and down, and sometimes wanting to go sideways. That is a verbatim quote of Marvin the Paranoid Android from Adam’s classic The Hitchhiker’s Guide to the Galaxy. –“John Headroom” is also another case of “two” Crichtons in the same episode and therefore a subtle reference to the Talyn-John/Moya-John dichotomy. –The recurring image of the vid-screen, which is set off by the TV that flies out of the tower at the beginning, also manifests in the form of the split-screen effect that occurs numerous times throughout the episode and really helps add to its completely deranged atmosphere. –You also have to love the twisted sense of humor on display here, which manifests probably most explicitly with two orally-based scenes, the first in which the male Zhaan “milks” himself, one breast of which provides acid (it’s an in-game riddle that, had John chosen wrong, would have lost him the game/possibly killed him), and the other of which gives milk, which John then actually had to drink–aw, Farscape–and the second in which D’Argo “eats” Jool, her intestines represented as a bowl of baked beans that seems to reside in her abdomen. –Another fairy tale reference: the Scarran in the red cloak. Little Red Scarran Hood? –As with the male Zhaan, Stark’s voice temporarily coming out of Scorpius is yet another subtle meta joke, because, before landing the role of Stark, Goddard actually first auditioned for Scorpy.